Everyone who has ridden an ElliptiGO bike knows that it takes a huge effort to ride the ElliptiGO at a similar speed to a road bike. The average person can expect to comfortably ride alongside even a very strong ElliptiGO rider, when using a road bike, but the reverse is certainly not true. So why should I dedicate an entire article towards riding the ElliptiGO as part of a cycling club? The reason is pretty simple. Many people buy an ElliptiGO bike specifically because they want to work out very hard – or because they want to get more fitness training out of less time – and because they want it to still be fun! They want to work themselves hard – and they want to get a lot fitter, whilst having a good time. And riding with cyclists who are on faster bikes is a great way to achieve this. I especially recommend this cycling group training option for ElliptiGO riders who are training for tough road running races, or ElliptiGO riders who are also competitive cyclists (and are keen to put in intense cross-training workouts to help build their bike racing endurance). A number of good cyclists have successfully incorporated ElliptiGO cross-training into their cycling regimes, in much the same way as a number of runners have also done. It is hard for even the most motivated athletes to push themselves to their limits routinely – week in, week out – but group training sessions, alongside cyclists in a bike club (or in a less formal cycling group) are a great way to ensure that you put in the necessary hard work if you need to push yourself and need ‘targets’ to keep up with. 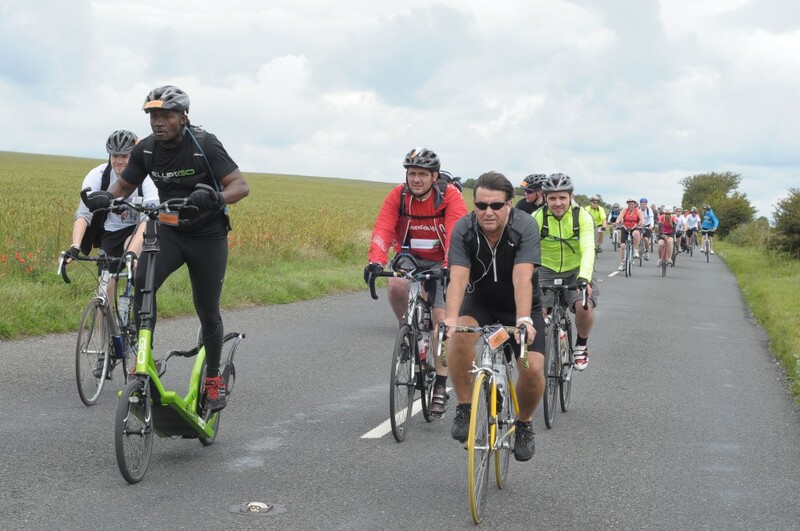 In a bike club ride with ElliptiGO riders involved, the riders on road bikes will often be having a more relaxed ‘social’ ride – while their ElliptiGO colleagues are putting in the rides of their lives! But these rides can be rewarding in different ways, for all the involved parties. The key to putting together speed sessions of this nature is to find the right cycling club, with the right riders. There are many different ‘ability-groups’ in a bike club and the fastest cycling groups will always be too fast for even an Olympic-standard ElliptiGO rider to keep up with for any meaningful distance. So the goal should be to find one of the riding groups which is of intermediate pace ability. Ideally, a cycling group which is pitched at a pace about 2-3mph faster than you are capable of riding on your own will work perfectly for an ElliptiGO high intensity training session. So if your best average training pace is 14mph (when you push yourself very hard, whilst riding the ElliptiGO on your own) seek out a cycling group which rides at about 16-17mph. Although that speed might seem impossible for you to attain on your own, riding in a group you will be able to sustain it for the same distance as you would when riding at 14mph on your own. The reasons for this added pace relate partly to physics. Having more riders around you makes the air easier to cut through. This effect is called ‘drafting’ and is most noticeable when you ride the ElliptiGO at the back of the group (which is the ideal place to position yourself on the ElliptiGO because it is likely the other riders will not be as familiar with your bike dynamics as you will be with theirs). But an ElliptiGO rider can even draft a single road cyclist – despite towering a lot higher – and still gain significant additional pace. The other component of the extra pace you will tend to have when riding an ElliptiGO in a cycling group relates simply to training within a group – and it is largely psychological. You will be performing under what are often referred to as ‘event conditions’ and, as we all know, athletes invariably perform better in competitive ‘event situations’ (or under public observation) than they do in solo training. There’s something about making ourselves accountable to others that brings out the best performances in us, so it is well worth harnessing this sort of motivation if you need to develop peak fitness. But there are other practical considerations to be made. Regardless of the fact that you can stick with a group of cyclists when working at your hardest, you are still unlikely to be able to go as far as they can, whilst working so hard. So it is a good idea to plan your liaisons in such a way that you get the best out of these group rides without having to necessarily ride the full distance that the cycling club will be riding. For many ElliptiGO riders that will mean only riding with the cycling club for part of their club ride. You can do this in a number of different ways. One way is to start earlier and then meet the cycling club at the start of the club weekend long ride – after you have already had a really good warm-up. The weekend long ride will go at a less aggressive pace, because of the distance, making it an ideal one for an ElliptiGO rider to engage with. And by showing up already fully warmed up, you can get GOing at road bike pace while the other riders are still warming up. Then ride with the group for your desired training duration (whether that’s an hour, two hours, or even three hours). Even the weekend long ride pace at most road cycling clubs is still pretty quick when you are riding an ElliptiGO! For shorter (and more intense) training sessions you will need to find faster cycling groups to push yourself sufficiently hard, but for the longer training sessions you will need to find slower groups – which you can work with for longer periods. 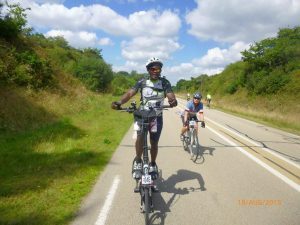 Touring cycling clubs tend to pace quite sedately and I have often found that I can complete all the rides that the local touring clubs do, when riding an ElliptiGO, without even pushing particularly hard. So that’s another good option for a long ride at a good pace – or just a social long ride. So it is important to find different cycling groups for your different training applications. Some cycling groups can be purely social for an ElliptiGO rider, with no high intensity component to the riding at all. I find that the ideal high intensity ride with cycling groups will last up to about 2 hours, which is a good use of my time. Longer rides are probably done at intensities that are not that hard for you to maintain on your own – and would be more social in nature. But what I usually seek from the group rides I do is the camaraderie of being pushed much harder than I’d be able to push myself if I were riding on my own. I find it difficult to push myself to my maximum when I’m training alone, so groups work well for me in this regard. Another good way to tie in with cycling club rides is to plan to join them at a point on their route which will allow you to end your session at their cafe/lunch stop. That way, you can indulge in the other social aspects of the ride after your training is done, before then heading off alone (for your warm-down ride, as you go back home). Take note – warming up and warming down are crucial aspects of this type of high intensity session and you will definitely appreciate the warm-up and the warm-down rides whenever you ride at your maximum intensity. There are other less tangible considerations to be made when choosing bike groups to ride with. These relate to the more social aspects of sports training. Those of us who ride what are termed “special bikes” are usually quite familiar with ‘bike snobbery’ – which is a pretty self-explanatory term. There are a number of bike groups where appearance is everything (and anyone who looks different, or does things differently, is not particularly welcome). And that’s fine. It’s not a legally recognised ‘prejudice’ and it is not worth making an issue about that sort of thing. So aim to find a cycling group which is open to outsiders – and also open riders on different types of bikes. A group or club that is respectful and welcoming. Trust me, this is actually the majority of bike clubs – and the more ‘closed groups’ are a small minority in the greater cycling community. It is quite normal for some cycling groups to ask what might initially seem like ‘ignorant’ questions (to you – who is already used to the ElliptiGO). But those are often quite innocent and legitimate questions (to people who have never encountered an ElliptiGO before). These could be questions such as “Is it stable?” or “Will those cranks catch the wheels of other riders?” etc, etc. Those are legitimate concerns to people who have never ridden an ElliptiGO, or have never ridden alongside one. So be patient – and be accommodating too – whenever you are asked various questions by any new cycling groups that you reach out to. If you explain yourself clearly it often clears those concerns out of the way. Good communication is the key to all successful human interaction! And showing up on the ElliptiGO, in person, is often the best way to initiate these discussions (rather than an email). Remember, it’s all about communication! At this point it is also important to address the important questions relating to the awareness of your own responsibilities whenever you seek to ride with other cyclists. And these responsibilities are the responsibilities of all cyclists – on all bikes – relating to things like calling out hazards to the riders behind you, signaling clearly and confidently, and riding considerately (in view of the dynamics of being in a group). Some cyclists (including some ElliptiGO riders, believe it or not!) don’t take the time to learn all the basics of cycling group communication (skills such as one-handed riding, pointing out hazards and signalling). But these core safety skills are accessible to everyone who bothers to adopt them – and if you have not yet learned them it is worth reading some of the basics of ElliptiGO riding which I covered in this article before joining a cycling group. However, most beginner cycling groups will teach you these skills really well and it is worth joining a slower beginners’ cycling group just to learn the road safety skills they will teach you. Once you’re fully comfortable with group riding dynamics you can then look to take on the more challenging training rides in faster cycling groups. Many of these social and group aspects of cycling are also made a bit easier by the fact that the best place for an ElliptiGO rider to be positioned is at or nearer to the back of the cycling group (in order to gain some advantage from being drawn along by the group – which reduces wind resistance and improves pace). So initially try to stick towards the back of the group – at least until you get used to your new cycling group (and until they get used to you). The other responsibility you have as an ElliptiGO rider is to keep your bike in decent running order – and well serviced. This is not just because you are, in some ways, representing all stand-up bikers (whenever you mingle in groups of road cyclists) but also because old and dirty tracks (on the long-stride ElliptiGO bike) can become noisy as they age and get dirtier. If the tracks are always kept clean (and are replaced at the correct service-intervals) your ElliptiGO will always run quietly, which will not intrude on the experiences of the other riders in a cycling group. So it is a good thing for ElliptiGO riders to seek out decent cycling groups to train and ride with, but let’s always be cognisant of our own responsibilities towards the cycling community and towards other road users (in our capacity as ‘representatives’ of the stand-up biking community) whenever we venture out into the cycling world! Now that the basic ‘hygiene factors’ associated with group training have been addressed, let’s take a closer look into the actual group training sessions and determine where this type of cycling club approach best fits into an ElliptiGO athlete’s schedule. 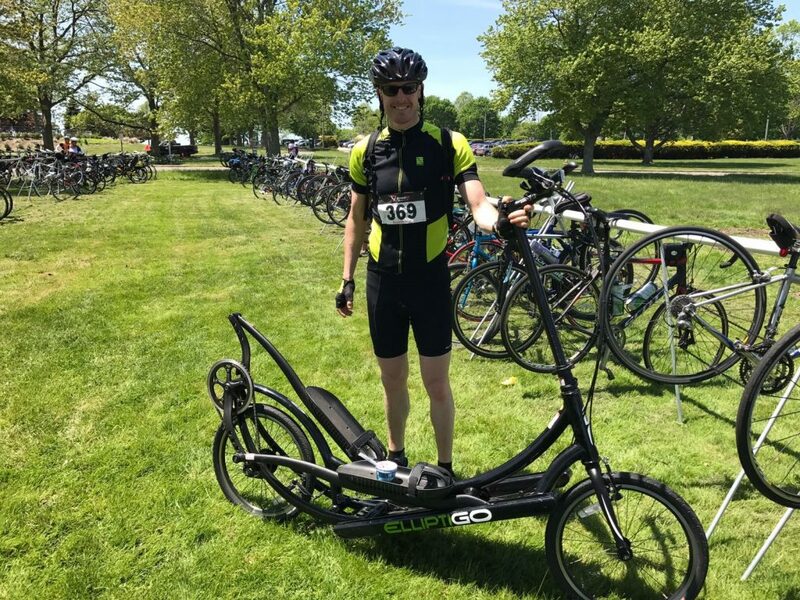 Let’s start with the groups of ElliptiGO riders most likely to want to do this, who are likely to be cross-training middle and long distance runners, aspiring cyclists and ElliptiGO riders who use their ElliptiGOs to participate in public long distance cycling events. Running is a very demanding sport – from both cardiovascular and physical impact perspectives – and one of the great benefits of ElliptiGO training relates to the opportunity to get a really intense impact-free workout (sometimes more intense than you could even achieve running) whilst using the same physiology and muscles used for running. This level of specificity of cross-training is very difficult for many runners to achieve using any other type of exercise equipment (or bike). So, for doing impact-free threshold sessions for your running training (whilst completely ruling out the possibility of muscle strains – and the usual injuries associated with high intensity running training) the ElliptiGO is a perfect ‘simulator’ of intense running training. This is true for all running training – but especially so for competitive running (or track racing) which involves incredibly high intensities and takes a big toll on the body over longer periods of time. By reducing the ‘brutality’ of training on the body, such runners can ‘preserve’ themselves and can smartly manage their exposure to high-impact training, without missing out on any of the benefits of high-intensity fitness conditioning. The same is true for competitive cyclists. Some riders find the specificity of the bike racing posture takes a big toll on their joints, when done for long hours (and at very high training intensities). So they can substitute some of their shorter rides for ElliptiGO rides that are done at higher intensities. This is a great use of your training time, especially because short sessions on a road bike don’t easily translate to good fitness gains. And ElliptiGO cross-training translates well to other types of bike riding fitness. As is the goal of all cross-training, ElliptiGO riding is specific enough to improve your road bike fitness, but it still gives your body a break from the aggressive ‘aero’ riding position common in bike racing and time-trial cycling. As long as cross-training athletes who are using the ElliptiGO still do a reasonable amount of their specific sports training, they will be able to retain the efficiency and the specific joint or contact-point conditioning of their primary sport, but they will also benefit from the ‘breaks’ they are getting from either impact or posture-related discomfort. Another common area where these intense ElliptiGO workouts in bike clubs can have a place relates to injured runners who are looking to replicate some of their toughest running sessions without any impact, on the ElliptiGO. A hard ride in a cycling group can be as tough as a very intense running race, if you find the right cycling group to push you (at just the right intensity for you to barely hang onto the group)! But this can be done without affecting the majority of running injuries (even those more serious running injuries that actually stop you from doing any running at all). The hills are especially challenging during these types of high intensity ElliptiGO rides we are discussing, because the ElliptiGO rider has to work so much harder in order to climb the hills at the same pace as a road cyclist (and then still has to work hard when going down the other side of the hills, in order to keep up with the coasting road cyclists)! But that’s exactly the sort of intensity many of us will be seeking whenever we decide to ride with cycling groups! Be aware, when you are new to ElliptiGO riding, that you will first need to put in a short ‘apprenticeship’ before you can consider riding in this way. Give yourself time to get well acquainted with ElliptiGO riding and really comfortable with the bike and with the correct riding form. Then build up your stamina and confidence over various distances and speeds. Once you have a good idea of where you are with your ElliptiGO fitness it is probably a good time to start looking at the more intense sessions. But first be sure that you are fit enough – and be sure than your riding form is good. Good form prevents strains, sprains – and even accidents – during high intensity group training. High intensity ElliptiGO training is great – when it’s ‘deployed’ correctly – as is social cycling. So why not combine the two ‘concepts’ for the ultimate fitness training experience? If you have any questions relating to this article I’m happy to answer them, just get in touch. Otherwise, I’ll be in touch soon, with more training information!